Professor Tom Inns is now Director of The Glasgow School of Art and during GIDE Design In Action 2012 was the Dean of Duncan of Jordanstone College of Art & Design, and Professor of Design at the University of Dundee. Tom started his career with Rolls-Royce PLC (Aero engines). 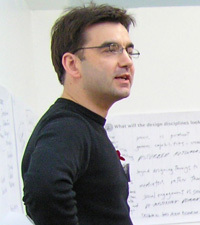 After completing his Masters at the Royal College of Art in 1990 he worked as a designer and researcher on a variety projects in which design thinking was used as a problem solving process. These projects explored new environmentally friendly architectural products, animal welfare, recycled materials and social issues such as the problem of solvent abuse. He was appointed as Director of the Design Research Centre (DRC), Brunel University in 1996. At the DRC he worked extensively with small companies through, the then, TCS programme and developed a series of design audit methodologies with the Design Council, Business Links and DTI. In 2000 he was appointed as Professor of Design at the University of Dundee. Between 2001 and 2004 he was Head of the School of Design and helped establish the University of Dundee’s pioneering new programmes in Innovative Product Design and Interactive Media Design. In 2004 he was appointed as Director of the AHRC & EPSRC funded Designing for the 21st Century Initiative. Over a five year period he led this £6.5 million initiative co-ordinating the work and outcomes of 41 design research projects in HEIs across the UK. He has a strong research interest in the future of design and the way design is used as a strategic tool within business. He leads a portfolio of research projects in this area and runs modules in strategic design thinking and strategic product development at both the University of Dundee and University of St Andrews School of Management. Tom regularly designs and facilitates knowledge sharing events and workshops both internally within the University of Dundee and with other organisations. Recent clients include NESTA, UK Design Council, ARDI Rhone Alps, UKERC, Swedish Industrial Design Foundation, South West Screen, PopVox and VINNOVA.